Is this safe to use on laminate floor? Yes, I believe so, but as always, I would suggest trying on an inconspicuous area first. 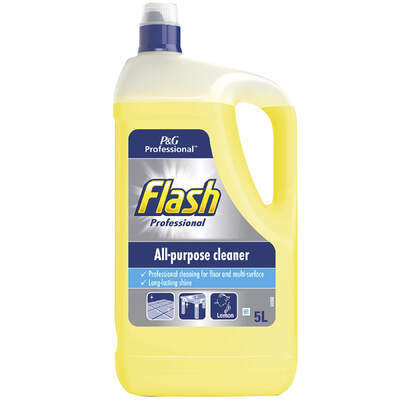 For surfaces that sparkle with a dazzling shine, the Flash All Purpose Cleaner in Lemon is the hardworking formulation that every busy workplace needs in their utility cupboard. Specially manufactured to cut through hard-to-shift mess such as grease, dirt and grime, this all-purpose cleaner works wonders on a wide range of surfaces including baths, showers and kitchen worktops. Effective in all water conditions, the lemon-scented formula leaves behind a clean and inviting scent while bringing your surface to a brilliant sheen with half the effort of alternative cleaners. For busy environments with a heavy cleaning workload, these 5-litre bottles come in a pack of 2 to keep your utility cupboards fully stocked.